Google updated its search tool. Its time to trow challenge to Yelp and Foursquare with its new feature that enables searchers to access the menu of most popular restaurants. This update is available only for the U.S. users as of now. If you type or say that “what’s on the menu at ABC restaurant?” or ask Google to “show me the menu at restaurant”, it will show up all the available restaurants. 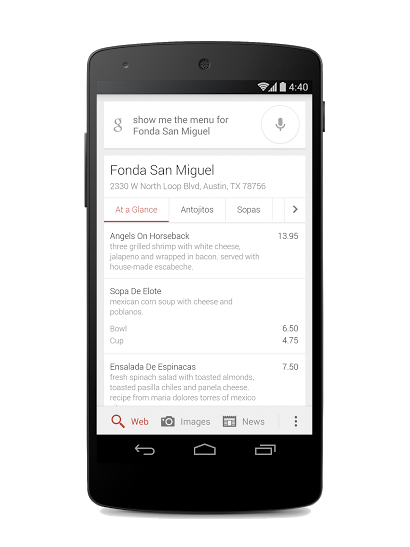 It is also found that Google has worked with an external data provider to provide the menu data. The partner name is not unveiled yet.